[WERE YOU CONNED INTO BELIEVING THAT OBAMA WOULD BRING 'REAL CHANGE'? 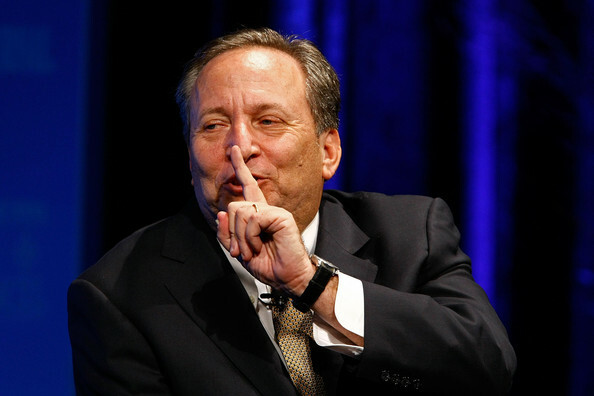 LARRY SUMMERS' BONEHEADED ANSWER TO THE 2008 FINANCIAL CRISIS: "The central irony of the financial crisis is that while it is caused by too much confidence, borrowing, lending & spending, it can only be resolved with more confidence, borrowing, lending, & spending,"
"Central banks keep reloading and doing dumber and dumber things, and since their stupidity seems to know no bounds, I’m willing to say that I don’t know how dumb things will get before they stop. What I do know is that locking in a guaranteed loss on bonds that are held to maturity is not a good way for investors to meet their long-term liabilities. Think pension plans and insurance companies for example. Central banks are eviscerating them. How insolvent pension systems and life insurance companies can be good for the global economy is beyond my pay grade, but then again, I don’t have a Ph.D. in economics." Bloomberg article on the latest boneheaded proposal by former U.S. Treasury Secretary Lawrence Summers on the idea of continuous purchases of stocks as a potential ingredient in a recipe for the developed world to strengthen economies struggling with subdued growth & inflation .. buying stocks on a sustained & continuing basis .. Summers: "There are obviously important political and economic questions associated with government ownership of companies." - like socialism & communism .. Summers reiterated his endorsement of central banks adopting a target for nominal gross domestic product, rather than inflation .. article: "He urged greater monetary-fiscal coordination, and said the BOJ’s adoption of yield-curve targeting is potentially constructive. Successful targeting 'operates in a positive way with respect to the government’s budget constraint, and therefore should enable more expansionary fiscal policies.'" - in other words, more government & central bank control, more financial repression, more of the same of what has caused this mess in the first place.